Prime Minister Viktor Orbán (photo: EPA). On September 15, 2015 the Orbán government will close the remaining gap in the Hungarian-Serbian border and begin to either incarcerate or expel migrants who traverse the razor-wire fence that has been erected along this frontier. The government is establishing three large extraterritorial “transit zones” near the location at which migrants have been streaming into Hungary from Serbia over the past weeks in order to quickly process asylum requests from those who cross the fence after September 15. Since the government considers all migrants who pass into Hungary from Serbia to be economic immigrants rather than refugees on the grounds that they have not fled war in the latter country, virtually none of them will receive asylum. Those who do not receive asylum will be immediately expelled from Hungary back to Serbia. Below is a summary of the events and circumstances that have produced this state of impending conflict between Hungarian state authority and migrants attempting to enter Hungary from Serbia. 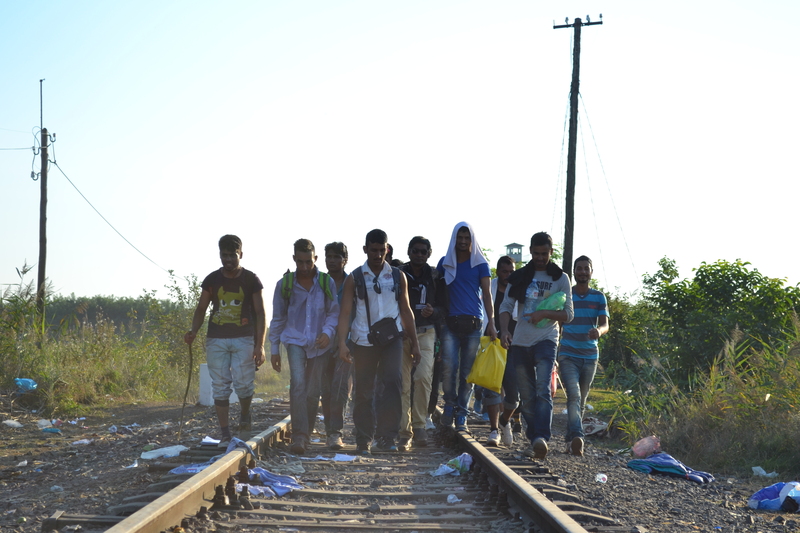 Refugees cross into Hungary from Serbia near Röszke (photo: Orange Files). According to the United Nations High Commissioner for Refugees (UNHCR), a total of 438,000 migrants applied for asylum in Europe in the first seven months of 2015, compared to 571,000 in all of 2014 (source in English). More than 350,000 migrants entered Europe during the first seven months of 2015 (source in English). A total of 155,443 migrants applied for political asylum in Hungary in 2015 through the first week of September after entering the country via the so-called Western Balkans Route passing through Turkey, Greece, Macedonia and Serbia (source in Hungarian). More than 150,000 of these migrants have subsequently left Hungary for various countries in Western Europe, primarily Germany (source in Hungarian). The number of migrants arriving to Hungary has grown from a few hundred a day this spring to between 2,000 and 3,000 per day this fall. The UNHCR estimated on September 8 that between 37,000 and 42,000 refugees would arrive to Hungary over the subsequent ten days (source in Hungarian). The large majority of those migrants currently arriving to Hungary are from either Syria or Afghanistan, though there are also many from Pakistan and Iraq (source in Hungarian). The 2008 Dublin III Regulation stipulates that applications for asylum within the European Union must be judged in the first EU state that applicants enter. This regulation is designed to prevent so-called “asylum shopping” in which individuals submit applications for asylum in several European Union countries in order to increase their chances of acceptance. European Union member states have not been enforcing the Dublin Regulation with regard to Greece since the European Court of Human Rights decided in 2011 that the country’s immigrant detention system violates the European Convention on Human Rights. Hungary was therefore responsible for receiving and judging the asylum applications of around 150,000 of the 350,000 migrants who entered the European Union in the first seven months of 2015. On June 23, 2015, the interior ministry of Hungary announced that it would temporarily block the return of asylum-seekers to the country from other European Union member states in accordance with the Dublin III Regulation (source in Hungarian). Other EU member states had previously returned 700 asylum-seekers to Hungary pursuant to the Dublin III Regulation (source in Hungarian). 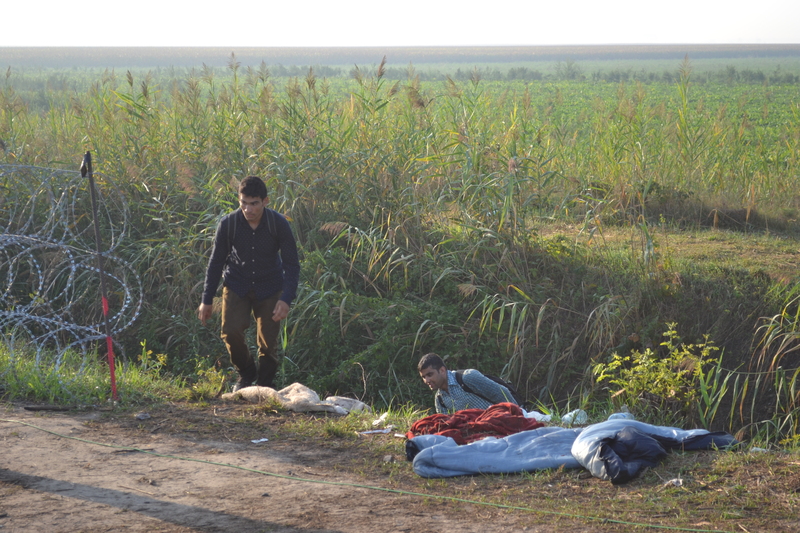 Refugees attempt to avoid police at the Hungarian-Serbian border (photo: Orange Files). Those who arrive to Hungary under what the government considers illegal conditions must apply for asylum in order to avoid expulsion to the country from which they entered, in this case Serbia. Almost all such migrants are reluctant to allow police and immigration officials to take their fingerprints and photograph as part of the asylum-application procedure because they fear that doing so will prevent them from subsequently seeking refugee status in Western Europe. Therefore, many migrants, particularly younger men, attempt to avoid applying for asylum in Hungary, fleeing from police after crossing the border from Serbia. Police apprehend the large majority of those who attempt to pass through Hungary without applying for asylum. Many of those migrants who arrive to Hungary have previously discarded their passports and identification papers in order to increase the difficulty of expelling them to their countries of origin. Therefore migrants, themselves, often provide officials from Hungary’s Immigration and Citizenship Office officials with names and other personal data that cannot be verified. Refugee camp in Debrecen (photo: MTI). Hungary’s Immigration and Citizenship Office (ICO) operates camps to house asylum-seekers at nine locations and is building camps at four other locations. At the end of August, 2,706 asylum-seekers lived at the existing camps—nearly double their normal capacity of 1,500 (source A in English and B in Hungarian). Through construction of new camps and expansion of existing camps, the ICO will gain the capacity to accommodate at least two thousand more asylum-seekers over the next few months. However, total capacity at camps in Hungary will not significantly exceed 5,000 even after the completion of the current construction and expansion projects. The largest refugee camp in Hungary is located in the city of Debrecen. 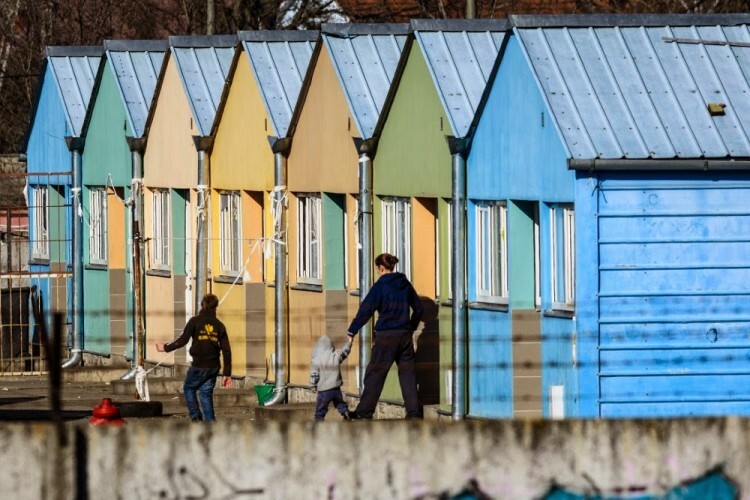 In May 2015, Prime Minister Viktor Orbán said “This camp must not be developed, but closed and those who live in it sent home!” (source in Hungarian). The Orbán government opposes economic immigration to Hungary. 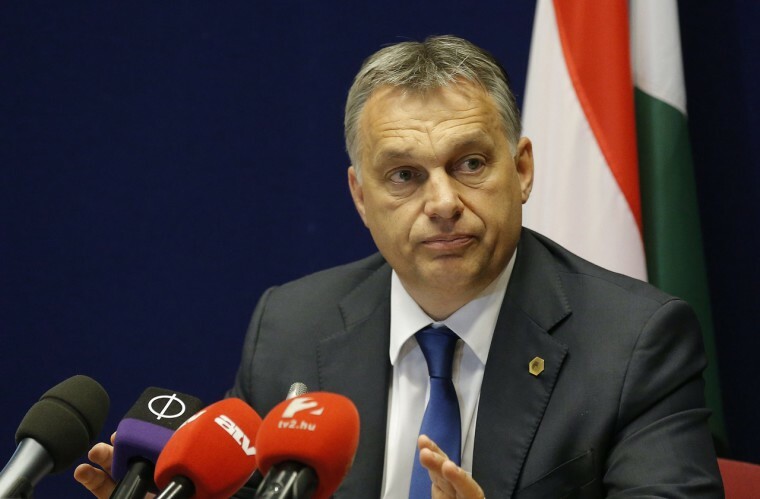 In January 2015, Prime Minister Orbán said “Economic immigration is a bad thing in Europe. It shouldn’t be seen as something that is of any use at all, because it just brings difficulty and danger to Europeans. This is why [economic] immigration must be stopped” (source in Hungarian). The Orbán government considers all migrants who cross into Hungary from Serbia economic immigrants on the grounds that there is no conflict taking place in the European states through which they passed en route to Hungary. In June 2015, Prime Minister Orbán stated “There is no political persecution in either Serbia, Macedonia or Greece. Thus those who arrive here have come from countries where they don’t qualify as refugees. They don’t have to flee from there, thus I would like to make it clear that everybody, regardless of why they left their homeland, is a subsistence immigrant (megélhetési bevándorló) once they arrive in Hungary, because they could have stayed in Serbia as well” (source in Hungarian). The Orbán government therefore opposes the permanent settlement in Hungary of any of the over 150,000 migrants who have arrived to the country from Serbia since the beginning of 2015. Classification of all migrants who arrive to Hungary from Serbia as “economic immigrants” also relieves the Orbán government of the obligation to comply with the stipulations of the 1951 Geneva Convention relating to the Status of Refugees. IF YOU COME TO HUNGARY YOU CANNOT TAKE AWAY THE WORK OF THE HUNGARIANS! 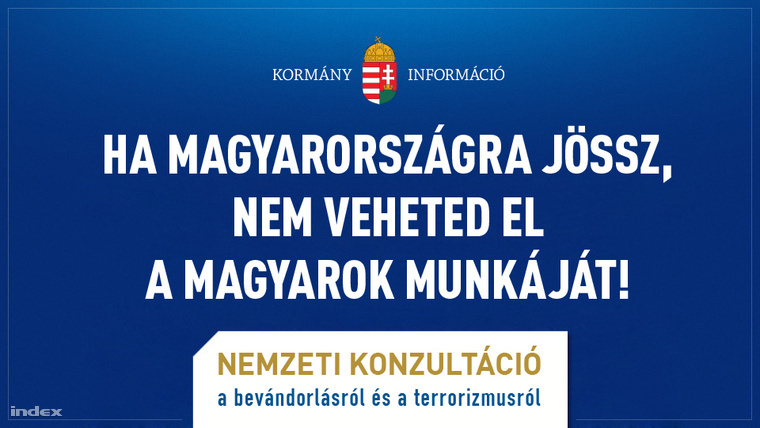 In May 2015, the Orbán government sent letters containing a questionnaire regarding “terrorism and immigration” to the eight million eligible voters in Hungary at an estimated cost of 3.1 million euros. This survey contained questions such as “There are those who believe that the advance of terrorism is connected to the poor handling of immigration by Brussels. Do You agree with these opinions?” (see National Consultation on Immigration and Terrorism for a translation of the questionnaire and the attending letter of introduction). In June 2015, the Orbán government placed billboard signs throughout Hungary bearing second-person messages to migrants in Hungarian such as “If you come to Hungary you cannot take the work of the Hungarians!” The government paid 1.2 million euros for these signs (see Sign War I for translations of all billboard messages). 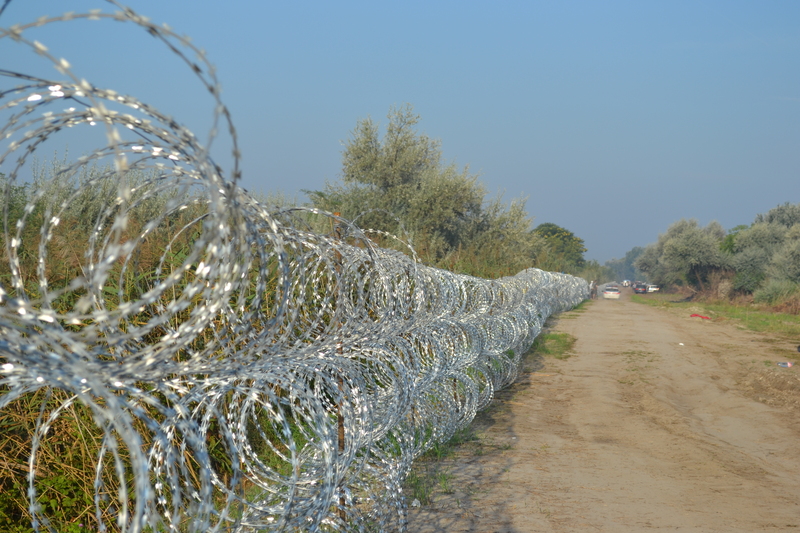 Razor-wire fence at the Hungarian-Serbian border (photo: Orange Files). In July 2015, the Orbán government began construction of a four-meter-high (13.1-foot) fence along the entire 175-kilometer (109-mile) length of the Hungarian-Serbian border in order to prevent migrants from entering Hungary from Serbia at locations other than regular frontier crossings. The government expects to complete the fence, which is located about ten meters from the border inside Hungary, by November 30, 2015. The government completed construction of a temporary razor-wire fence along Hungarian-Serbian border at the end of August 2015 (source in Hungarian). However, migrants are still able to enter Hungary on foot from Serbia through a single gap left in the fence where a railway crosses the border near the village of Röszke. The government plans to build a special gate at this location in order to close the remaining gap in the temporary fence. The government has not revealed the total estimated cost of the fences. Citing unnamed interior-ministry sources, the opposition newspaper Népszabadság reported that the fences would cost around 28.7 billion forints, or 91.6 million euros (source in Hungarian). In May 2015, the European Commission issued a proposal to relocate 40,000 asylum-seekers from Greece and Italy to other EU member states according to a quota system based on GDP, unemployment, population and existing number of asylum-seekers. Under this plan, Hungary would have received 2.07 percent of these asylum-seekers (source in English). However, Prime Minister Orbán rejected the proposal, stating that “The European concept of someone letting immigrants into their country and then distributing them among the other member states is a mad and unfair idea” (source in English). At a meeting of European Union interior ministers in Brussels on in July 2015, Hungary was the only country in the EU that refused to accept even a single asylum-seeker under the relocation and resettlement plan (source in Hungarian). EU member states in Western Europe have generally supported proposed quota systems for the relocation and resettlement of asylum-seekers, while those in Eastern Europe have generally opposed them on the grounds that they are not prepared to accommodate immigrants, specifically Muslims (source in Hungarian). At a meeting of heads of government from the Visegrád Group in Prague on September 4, 2015, the prime ministers of Poland, the Czech Republic and Slovakia expressed varying degrees of support for Prime Minister Orbán’s migration policies (source in Hungarian). Syrian refugees demonstrate at the Eastern Railway Station (photo: Orange Files). On August 23, Hungarian police removed 150 migrants from a train preparing to depart from the Eastern Railway Station in Budapest to Munich (source in Hungarian). Beginning on this date, police began preventing migrants who lacked valid passports and visas from boarding trains at the station bound for Austria and Germany. No government officials from the relevant countries offered any explanation for this sudden change in policy. Over the subsequent days, the number of migrants residing in the transit zone located in the underpass outside the Eastern Railway Station rose from a few hundred to a few thousand. Migration Aid, a private organization that began as a Facebook group in the spring, provided food, blankets, clothing, medical care and other basic assistance to the rapidly increasing number of stranded migrants. The police represented the sole presence of the Hungarian state at the station during this period. Syrians began to demonstrate on August 29 on the square outside the station in order to voice their demand that they be permitted to travel to Germany. Syrian migrants had interpreted an August 26 announcement from the Federal Office for Migration and Refugees in Germany that it would suspend application of the Dublin III Regulation in the case of Syrians to mean that they had the right to settle in that country (source in English). Many of the Syrians and migrants from other countries were also angry because Hungarian State Railways (MÁV) had continued to sell them train tickets to Vienna and Munich even after the imposition of the travel ban. Moreover, MÁV refused to provide the migrants with cash refunds of more than 40 euros for their unusable tickets, instead enforcing the established regulation that full refunds be transferred to addresses or bank accounts in Hungary. Orange Files talked to many Syrians who displayed unused train tickets on which they had in many instances spent several hundred euros. 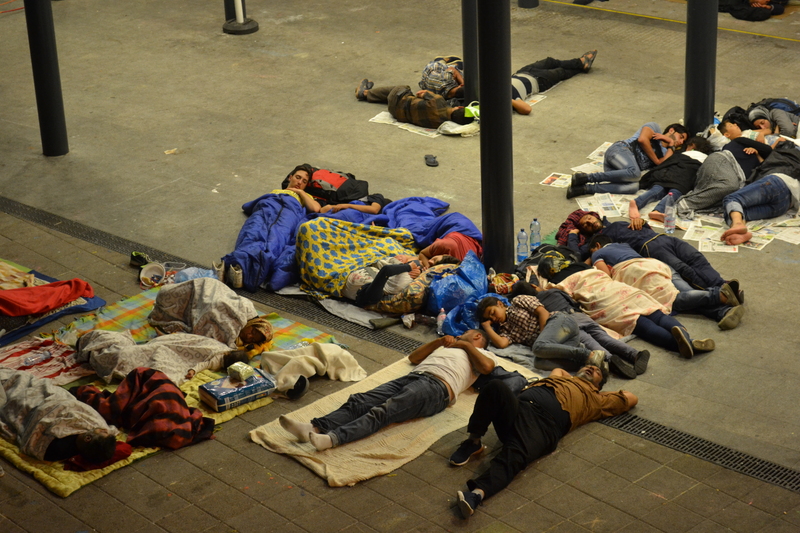 Refugees sleeping at the Eastern Railway Station in Budapest (photo: Orange Files). Amid the growing humanitarian crisis and increasingly frequent demonstrations, the Eastern Railway Station became the focus of intense media attention. Television crews from around the world broadcast live reports from the squalid transit zone and the square in front of the station at all hours of the day and night. On August 31, police permitted several hundred migrants to board three trains bound for Austria at the Eastern Railway Station. However, on September 1, police blocked the main entry to the station and again prevented migrants from boarding international trains. Syrians and other migrants began to stage sit-down demonstrations in front of the station, chanting such slogans in English as “Germany! Germany!” and “Let us go!” By early September between 3,000 and 4,000 migrants were residing in the station underpass, many of them sleeping on the hard concrete without blankets. Prime Minister Viktor Orbán explicitly blamed the European Union and implicitly blamed Germany for the crisis at the Eastern Railway Station, claiming that their defective immigration policies had caused uncontrolled migration (source in Hungarian). Chancellor Angela Merkel of Germany rejected this criticism, noting that all signatory states are obliged to uphold the Geneva Convention relating to the Status of Refugees (source in Hungarian). 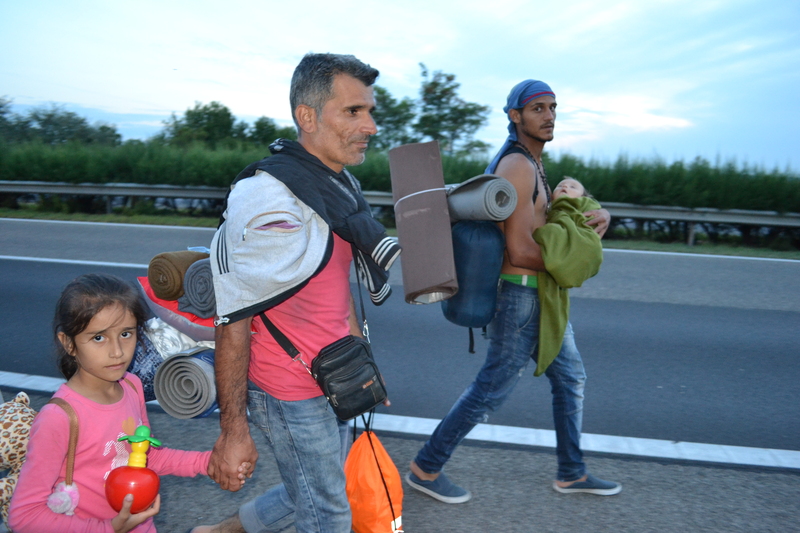 Syrian refugees walking along the M1 highway toward Austria (photo: Orange Files). 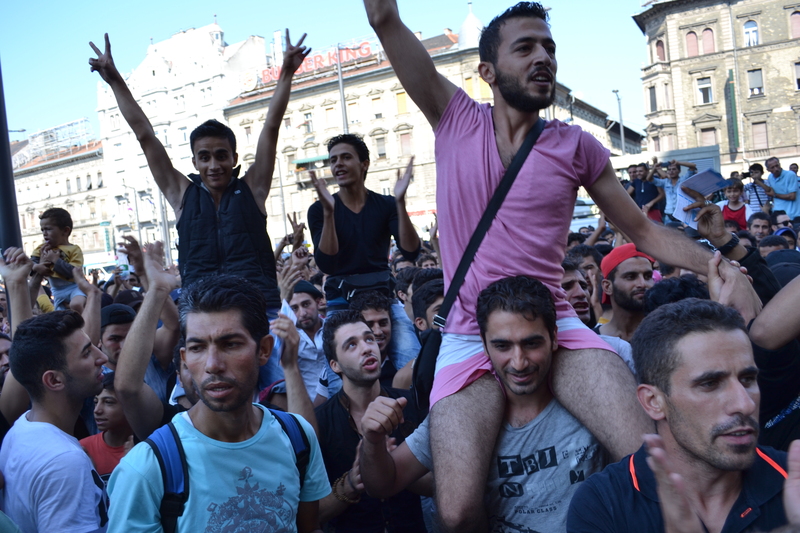 On September 4, between 1,500 and 2,000 Syrians left the Eastern Railway Station and proceeded through Budapest to the M1 highway to make the 200-kilometer trip to Austria on foot. That evening, Prime Ministry chief János Lázár announced that the government would transport these migrants up to the Hungarian border by bus in order to prevent traffic congestion on the M1, declaring that “We cannot wait for the European Union [to act], just as we cannot wait for Austria or Germany either” (source in Hungarian). Later on September 4, Chancellor Werner Faymann of Austria announced that following consultations with Prime Minister Orbán and Chancellor Merkel he had decided to open the border of Austria to all migrants in Hungary (source in Hungarian). On the early morning of September 5, dozens of Budapest city buses transported the 2,000 to 2,500 migrants who had remained at the Eastern Railway Station to Austria, thus ending the immediate crisis. By the late morning of September 5, Austria had received 6,500 migrants from Hungary, most of whom traveled immediately to Germany (source in Hungarian). These laws criminalize passing through or damaging border barriers (fences), prescribing punishments of one to five years in prison for committing these crimes. The laws stipulate that cases involving passing through or damaging border barriers will be tried under expedited procedures at courts in the city of Szeged near the Hungarian-Serbian border. In cases involving migrants, these laws exempt courts from the stipulation in the criminal code that defendants be informed of all charges and verdicts in a language that they understand (source in Hungarian). The laws authorize the government to declare a “state of emergency due to mass immigration” that would permit the police to enter private residences without a warrant to search for migrants. The laws increase the maximum penalty for human smuggling to ten years in prison. On September 21, the National Assembly will approve another law that will permit the government to deploy the Hungarian army to perform border-control duties. Soldiers carrying out such duties will carry loaded weapons, which they will be authorized to use to defend against “attacks gravely endangering life or physical security” (életet vagy testi épséget súlyosan veszélyeztető támadás). The Orbán government will thus be able to deploy the army at the Hungarian-Serbian border beginning in late September. See following sources in Hungarian: A, B, C, D and E.
Nearly all Hungarians Orange Files has talked with about the 2015 mass migration to Europe, regardless of their political inclinations and affiliations, cite the interventions of the United States in Iraq, Afghanistan, Libya and elsewhere in the Muslim world as the primary cause of the crisis. In the opinion of Orange Files, the general appraisal among Hungarians of the role that the United States plays in world politics has never been so negative as it is now—not even at the time of the U.S. invasion of Iraq in 2003. Note: On the evening of September 10, Prime Ministry chief János Lázár announced that the government would not establish the planned transit zones at the Hungarian-Serbian border and would continue to process the asylum requests of migrants who enter Hungary via the regular frontier crossing at camps inside the country (source in Hungarian). Note 2: On September 11, the Orbán government sent 3,800 soldiers to defend the Hungarian-Serbian border even though the National Assembly has net yet adopted the legislation that was thought to be necessary in order to do so.